Why make your own fuel? Because you can! Alcohol is a remarkable substance: it gives us pleasure, can be used as medicine, and has many commercial uses, including automotive and aviation fuel. I like to think of it as "sunlight in a bottle". You can get better performance from your engine, and it doesn't pollute! It has been used in racing engines in the Indianapolis 500 for over 80 years! The distillation column is separate from the boiler, and the coils are inside the still. I first got interested in alcohol as an alternative to petroleum in 1978, after reading an article in Mother Earth News, about someone making ethanol from corn. He used it instead of gasoline to run his pickup truck. I started experimenting in my spare time, and I made my first still, solar powered, which I demonstrated at the Whole Earth celebration fair at UC Davis, that same year. What really interested me about this was that grain alcohol (ethanol) is a renewable fuel, and also, it is pretty much pollution free, since the by-products of combustion are only water and CO2. Furthermore, it is economical to make, and your car will run cooler, faster, and better on ethanol. And, best of all, you don't have to fight wars in the Middle East to protect it. Think about it: plants are the world's most advanced solar collectors, and they have been at it for millions of years. Petroleum is fossilized solar energy, but present-day sunlight is stored by plants in the form of sugars and starches. Yeasts are little critters which like to eat sugar and alcohol is their waste product. Yeast organisms convert the sugar into a simpler and more useable form of energy. You don't have to throw away the internal combustion engine to convert a car to run on alcohol: just some minor adjustments, really. Electric cars will still need to get their power from somewhere (usually the dirty old electrical grid), and they have to carry around a lot of heavy batteries, but only have an effective range of a couple hundred miles. Alcohol, on the other hand, can give you the same miles per tank of fuel, with the same or better acceration. I personally have driven five of my own cars on it, as well as many others. I have been able to get the same miles per gallon on 160 to 180 proof as I did with gasoline. There is hardly any pollution: no heavy hydrocarbons, so no SMOG. Best of all, I found I had the freedom of driving around on a fuel I had made instead of buying it from fat cat oil barons. I didn't mix the alcohol with gas in those days: I ran it straight. Now, in 2004, (25 years after I started building stills and promoting ethanol), you can buy a car that is factory ready for alcohol fuel. In some states (mostly in the Midwest) you can buy E85 (85% ethanol, 15% gasoline). The cars these days are made with variable fuel injection technology, which measures the oxygenate content of the fuel (since alcohol, ETOH, contains an oxygen molecule which makes it burn more efficiently when the timing and air/fuel mix are appropriately adjusted by a computer chip that is factory installed. E85 is 102 octane. It burns clean and is better for the engine because it burns cooler, with less carbon buildup. Are you driving a car that is already factory made for E85? Did you know you can make your own E85? 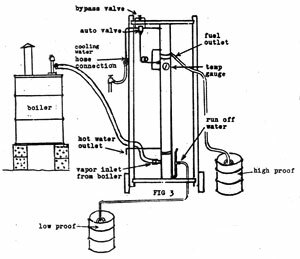 If you would like to order the blueprints for building this high proof, high production alcohol fuel still, click the credit card button, above. This provides a secure transaction via Paypal to pay $30.00 (US) for plans for building the Charles 803 still. You will get a 1500 kilobyte Adobe (PDF) file e-mailed to you, plus the hardcopy of blueprints for the Charles 803 still, sent by post. Robert Warren has perfected this still and written 40 pages of clear and detailed instructions. You will also get step by step photos not included in this website. The Adobe files include 40 pages of text, photos and diagrams. This is sent by email within one day, and then the hardcopy of the still blueprints is mailed within two days. If you don't have or don't want to use a credit card,then e-mail me for other payment options via the post. Note: Robert Warren passed away on November 21, 2004, from cancer. Before he died, he asked me, his daughter, to maintain this site and continue to distribute his still plans. The instructions and blueprints are still available to order. Thank you for your support of my father's work. MAKING MOONSHINE LEGALLY: Here I am in Boulder, Colorado, turning Boulder Beer into 180 proof, high-octane fuel. In back of the 5 foot tall distillation column is a 50 gallon drum sitting on my homemade boiler made from a discarded water heater. A black hose brings the hot steam into the bottom section of the still, while the cooled 180-proof pure grain alcohol drains out the clear tubing into a 5-gallon glass bottle. 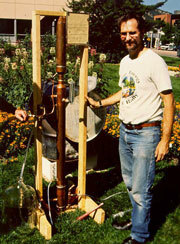 This was a legal public demontration of home distillation at a renewable energy fair in the Boulder, Colorado city park. I have a BAFT permit attached at the top right corner of the still's supporting frame. 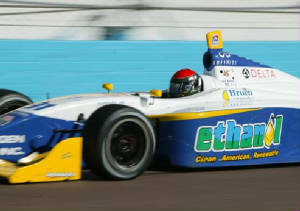 click on photo for more on Paul Dana racing with E85 power!